Meet your requirements for a value-priced, versatile printer with Intermec’s most popular printer. 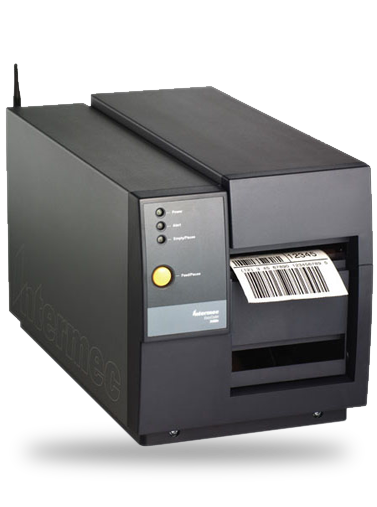 Our refurbished Intermec 3400 with its 11.43 cm (4.5″) maximum label width, unlimited label length and 203 dpi resolution makes it suitable for most of today’s bar code label standards. Contact us today about buying, servicing, renting or selling Intermec 3400 gear! Overall performance of the refurbished Intermec 3400 has been enhanced. Print speed has been increased from 5″/second to 6″/second and RS-232 serial port communication speed has been doubled. A heavy duty cutter with tray option is available on the Intermec 3400D. Of course, our refurbished Interemec 3400 is fully backward compatible with 3400A/B/C printers and is backed with Sterling Mobile’s 90 Day Warranty Contact us today about buying, servicing, renting or selling Intermec 3400 gear!